Rosehip seed oil contains Vitamins A, C, and E which assist cell regeneration and stimulates collagen and elastin production. Maintains the softness and elasticity of the undereye area, the eyelids, and the area surrounding the eyes. The eyes show the first signs of aging, so it's important to get into a morning and night care routine. Directions: Apply morning and night to protect and refine delicate eye tissue and to prevent dryness which leads to wrinkles. May be layered with the Eye Balm for maximum eye skin care. I find that I use more Eye Oil during the winter months and more Eye Balm during the humid summer, and as I age, I have more need for layering both products. Borage, apricot kernel, coconut, macademia nut oil, rosehip seed oil, wheatgerm oil, Vit E oils, carrot tissue extract, seabuckthorn berry oil, two special secret oils, a proprietary blend of pure essential oils which include neroli, rose otto, frankincense, elemi, carrot seed, and more. Excellent for all skin types and all ages. This luxurious EYE BALM is handmade with nurturing organic oils, butters and precious essential oils, specifically selected to soften and hydrate the delicate skin around the eyes. I have improved this formula so that you only need to use a tiny amount which absorbs quickly. Test it on the top of your hand -- you will see the effect immediately, feel the silky softness. Fabulous for sensitive skin, men and women. Apply after cleansing and toning. Excellent for the lips too, especially the area around the upper lip that tends to become lined and feathered as we age. Ingredients include superior natural and organic butters, oils and essential oils: Rosehip Seed oil, Sea Buckthorn oil, Vitamin E oil, Borage oil, Avocado oil, Walnut oil, Macadamia Nut oil, Organic Unrefined Shea Butter, Organic Avocado Butter, Organic Cupuacu Butter, Organic Mango Butter, Organic Kapangnan Butter, Organic Macadamia Butter, Organic Avocado Butter, Organic Babbasu Butter; Essential Oils: Chamomile, rose, carrot, helichrysum, bitter orange, lavender, elemi, palmarosa. All Flutterbye skin care products contain completely natural ingredients, are non-GMO, paraben-free, alcohol-free, non-toxic, chemical free, cruelty free, fragrance free, and SLS derivative free. I want to tell you that I have been using the eye balm for two months now and I really love it, it feels so good to my tired skin and it doesn't 'migrate' into my eyes. My skin feels wonderful when I wake up, not dry and irritated like it used to. And this little jar is lasting such a long time! I'm so pleased and won't need to use those much overpriced little jars from you- know- who ever again! -Faye R.
"Daily environmental damage leads to premature aging." 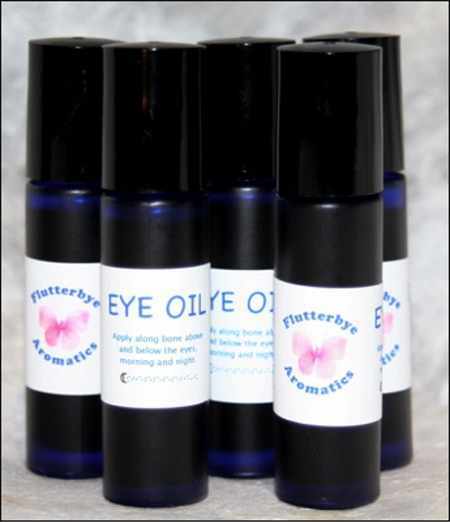 Flutterbye Anti-Aging Eye Treatment is a gentle, rich boost for all skin types, enhanced with botanical hyaluronic acid, flavonoid rich rooibos & pomegranate extracts, lavender, blue-green algae*, calendula, olive leaf extract and evening primrose oil to retain moisture in the tender and delicate skin around the eyes, and to correct the appearance of dark circles. The botanicals (lavender, calendula, olive leaf, green tea) detoxify the skin, calm irritation and environmental damage and block free radicals to protect the skin against further premature aging. Maintaining the proper levels of nutrients is particularly important to aging skin and Flutterbye Anti-aging Eye Treatment provides everything your skin needs to look its best. Contains beneficial all natural ingredients that work synergistically to balance, soothe and supply moisture, including organic jojoba, organic aloe, organic sunflower seed oil, Vitamin E oil, organic botanicals; a superior formula designed to help halt the appearance of aging skin. Anti-aging Treatment for puffy eyes, eye bags, fine lines and wrinkles. CoQ10 and Japanese Green Tea fight free radicals that damage skin and cause aging; hyaluronic acid hydrates and improves dermal matrix**, restores moisture loss. Flutterbye Anti-Aging Eye Treatment repairs, tones and calms; leaves skin more radiant and refreshed, increases elasticity, reduces puffiness and inflammation, helps even out skin tone, provides antioxidant benefits. Also useful on dry areas on face and hands. Vegan, gluten-free, fragrance free, Non-GMO; cruelty free, not tested on animals. Contains no harsh ingredients or any chemicals, which can cause free radical damage, aging and/or drying the skin. Mainstream formulas contain chemicals such as Isopropyl alcohol, which can actually dry the skin. Flutterbye products never contain sulfates, parabens, phthalates, carcinogens, acrylates, formaldehyde, phenoxyethanol, or chemical preservatives. How to use: Apply a small amount to clean skin morning and night. Simply tap your finger tip around the orbital bone and out to the side where crow's feet tend to form until the area is covered and the product absorbed. Next, apply to the area around the upper lip. *Blue Green Algae, which is packed with essential beneficial nutrients, is quickly absorbed into the skin, delivering vitamins and minerals that help soften and hydrate the skin. **Hyaluronic Acid & dermal matrix – HA has a significant ability to hydrate the skin, encouraging new skin cell growth. With age, the under-eye skin often appears crepe like. That's because the dermal matrix has become thin and lost its elasticity. Hyaluronic Acid penetrates to the cellular level of the skin and delivers moisture where it is needed most. What makes HA special is how it binds the moisture to the skin cells, allowing for a plump, supple and vibrant dermal matrix.